These DVDs offer a step-by-step guide on how to use the wide range of modes provided by your camera from the basic use of exposure modes to the advanced features and customisable options. They are well illustrated with images which show the photographic results from each technique. This DVD is a visual chapter-based reference guide, allowing you to learn at your own speed. It is also an excellent companion guide to the Making the Most Of series DVDs, providing the basics that are needed to fully grasp the more demanding features of today's digital cameras. 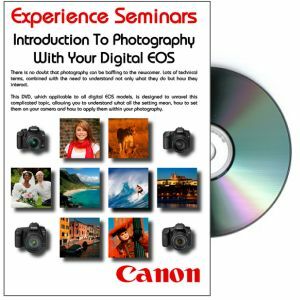 It is applicable to any digital EOS model in the Canon range and provides you with the grounding that is critical to successful photography. As well as explaining the features of EOS cameras, it also looks at how the different elements can be combined to give the best possible results.